What would it be worth for your team to be confident, effective communicators? Are Your Employees Poor Presenters, Lacking Confidence? Can Speakers Improve Dramatically In Just One Day? For groups of 5 to 12. Feedback is positive and supportive, yet candid and challenging. Change happens fast. All exercises are videotaped and participants receive their own video to keep. See measurable results in mere hours… Really! This is not a boring lecture about presentation theory — it is an "oh wow… we're actually doing this," immersive experience for each participant. Master the tools of engagement. Create lightbulb moments for the crowd. Easily handle the unexpected without skipping a beat. Conquer fear, control nervous energy, and speak confidently. ​The science behind stunning improvement. 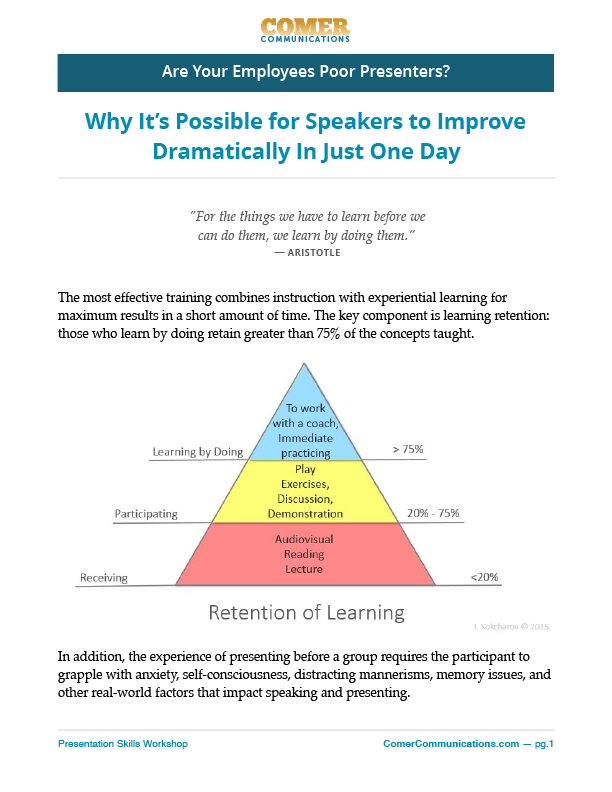 "Can speakers improve dramatically in just one day?"